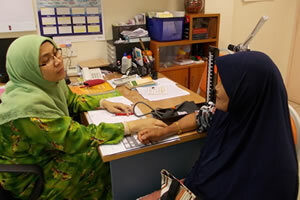 BANGI, 14 Aug 2012 – A qualitative survey on two groups of diabetic patients over 60 found that there was a lack of family support needed to control their glucose intake. The survey aslo found that the patients themselves needed to be aware of their blood glucose level and have the determination to control it. 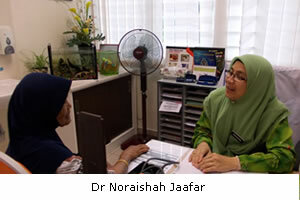 The study “Elderly Diabetic Patients’ Perception on Family Support and Glucose Control” by Associate Profesor Dr Rahmah Mohd Amin and Dr Noraishah Jaafar from Department of Community Health of The National University Malaysia Medical Centre (UKMMC) recommended that family members of patients be given health education and advice on proper food preparation for diabetics. They found that family involvement could motivate the elderly suffering from the ailment to control their blood glucose levels. The study was published in the International Journal of Public Health Research Vol 1 No 1 2011. It was conducted in Kulim, Kedah from February until May 2009. Ten respondents were sampled based on their level of glucose control. Five were from the good glucose control group (HbA1c 6.5% or less) and another five from poor glucose control group. In depth interviews using semi-structured guide was used where conversations were taped, transcribed and analysed using thematic analysis. The respondents consisted of three males and seven females. All of them were Malays aged between 60 and 73. Five of the women are widows – four staying with their dughters while one with a grandson – while two more stayed with their husbands. All three men stayed with their wives with one of them aged 66 having tertiary qualification with a pension of RM2000 a month. Poor glucose control has been an issue among diabetics and especially among the elderly, who have limitations due to visual and hearing impairments and low physical energies. “They needed help from their family members in their daily activities. The study was carried out to explore the role of family support in controlling blood glucose among the elderly diabetics,” said the researchers. Elderly are those aged 60 and above as defined by the United Nations. The elderly population is seeing an increasing trend globally. In 1950, elderly made up of just 8.2% of the total world population, increasing to 10.0% in 2000 and is projected to reach 21.1% in 2050. The elderly are often associated with multiple social and health problems. “They live alone, having hearing and visual problems, lack of physical abilities as well as having chronic diseases such as coronary heart disease, stroke, dementia, hypertension and diabetes mellitus. “Family institution plays an important role in the social support of the elderly with the main support from their spouses, children and other family members, who can provide the emotional, physical and information support. “Emotional support includes having love and affection, sharing problems and having somebody to take care and to share their personal problems. The children could also help provide financial support especially those without regular income. Though there had been greater migration from rural to urban areas, the family institution is still the main social support system. As such relationship between parents and children should be strengthened and especially for elderly diabetics where family support plays an important role in managing the disease including food and drug preparations, blood glucose monitoring and transportation to the clinics, they said. The study found that there was a perception that family members do not play a role on their glucose control and food preparations by their family members influenced the respondents’ diet intake especially for those with poor glucose control. Thus no special food was prepared for the diabetics who eat the same food cooked for the whole family. Nutritional education is thus important for diabetic patients and their families. The study showed that all the respondents from the good group have good motivation and practised healthy diet while those from the poor glucose control group did not have healthy diets. Despite being told to control their diet, most of them still cannot resist sweet food as self determination is not strong among them. 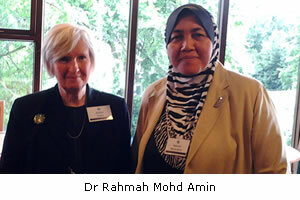 They eat as if they do not suffer form diabetes and both Asso Prof Rahmah and Dr Noraishah felt that health education could help solve the problem alluding to a previous study which showed that patients who attended health education sessions frequently have better glucose control compared to those who did not. Therefore, family members should increase their knowledge regarding dietary control and useful advice in diabetes management. They could motivate the diabetic patients to control their blood glucose. The researchers admitted there were limitations in their survey as it was carried out only among the Malays and thus could not be extrapolated to the multi-racial population. The study had also not explored the respondents’ physical activities and exercises although they could influence the glucose level. The elderly diabetics should be encouraged to change their lifestyles, practice healthy diet and do physical activities, the study recommended.